During the Ming dynasty (1368-1644) efforts were made to recover elegant old music thought to have been neglected during the Mongol rule of the previous dynasty. The focus of this was copying out and reprinting old scores. The Ming dynasty then produced a number of musical treasures of its own. However, most of this was lost, either because the music was not written down, or it was written in an outline form which defies current understanding. On the other hand, since 1425 a great deal of music for the guqin zither has survived in extensive tablature collections (qin handbooks). Many of these musical scores were copied from older sources, the earliest surviving piece dating from the early 7th century. In addition there also existed considerable literature explaining the tablature. This means that by using principles of historically informed performance to reconstruct music from the tablature we not only can hear the relationship between guqin melodies as they have survived today and ways they were played when they were first written down, we also can experience through reconstruction many more ancient melodies that would have disappeared had they not been written down. As for the present program, each melody selected is the earliest surviving version of that melody, and all the melodies are interpreted according to the principles of historically informed performance: the guqin has silk strings, the original tablature is followed as closely as possible, and commentary (in conjunction with the associated website commentary) puts the music into its historical and philosophical context. In this way this series of performances brings to life great treasures of a bygone era. Melodies for the Hong Kong initial presentation of this series included the following. Each entry has links going to recordings of and commentary on the melodies. 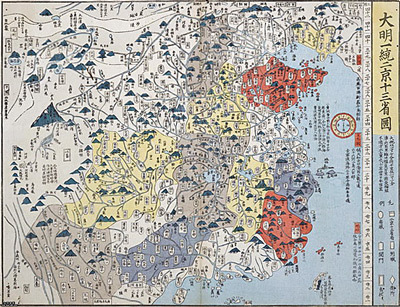 The map at right, showing the extent of the Great Ming dynasty, was originally published in 明一統名勝志 Ming Yitong Mingsheng Zhi (further details with the melody Da Ming Yi Tong. This version of the image was copied from the internet: I have not seen that book, and as yet have found no connection between it and the melody (discussed there and below) other than the title. It should be noted that the Ming dynasty was sandwiched between two non-native dynasties, preceded by the Mongol-controlled Yuan dynasty then overthrown by the Manchu-controlled Qing dynasty (1644-1911). The Recital Hall is on the eighth floor of the Hong Kong City Hall. Tickets on sale through Urbtix from 24 May 2014. Program notes given out at the performances had detailed information about each piece; these were mostly abbreviated forms of the notes linked above in each entry. The performance itself, however, was focused on the music itself. During the performance there was some commentary, but most of it served to demonstrate aspects of the music, in particular those that were used in the process of reconstructions or that seem important to general appreciation. These aspects include musical structure, modal qualities and relationships between melodies. After the music there was a question and answer session in Cantonese as well as English. It should be emphasized that much of the analysis of music of this period must be considered as tentative. For example, trends in the music during this period are considered on such pages as Some Issues in Historically Informed Qin Performance and An historical view of guqin ornamentation. However, although these comments are based on reconstructing over 200 melodies, only one version (the earliest) of each was actually "completed" (with recording as well as transcription). So although during this process some comparison was done between the earliest published versions and other versions of the same melodies, not nearly enough is known for the comments to be considered conclusive. 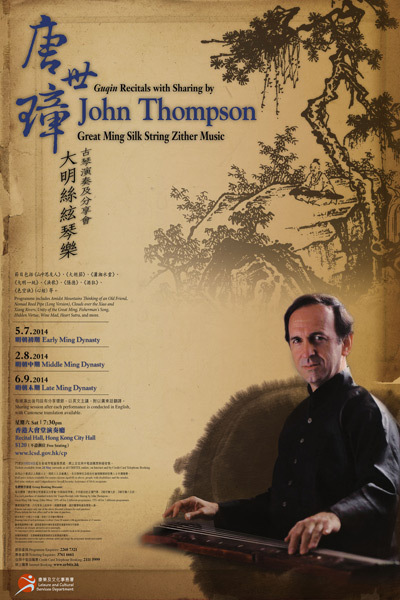 John Thompson's website has detailed information about him and his music projects. See, for example, this short introduction and this more detailed version. When repeating this series many items could be changed. This program includes melodies from two handbooks, dated 1425 and 1491 respectively. Both consist of melodies collected in the Ming dynasty, but some of the sources might actually reflect versions as played during the Song dynasty or earlier. This program includes melodies from handbooks dating from 1511 to 1571. As with the other programs in the series, all melodies are played strictly according to the earliest known tablature for each of them. 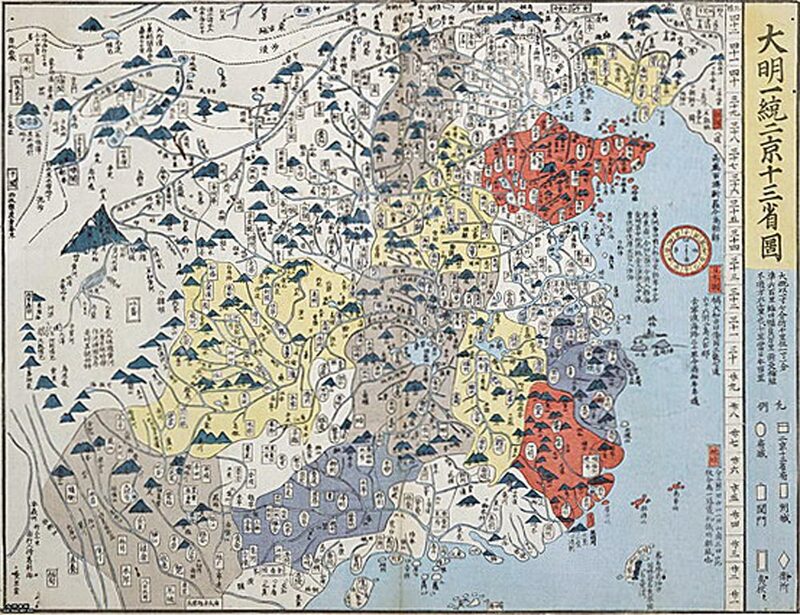 Although all have their earliest publication in what is considered here as mid-Ming, it is not yet possible to discern special characteristics of the music from this particular period (compare overall Ming trends). Some melodies apparently had recently been created, others might already have had a long history. Three melodies are what might be called hymns. Guqin melodies rarely take the form of chants or hymns. The previous recital introduced one exception, Unity of the Great Ming, which might be seen as a sort of early patriotic hymn. The first three items in the present program are what might be called religious hymns, one each for Daoism, Confucianism and Buddhism. Each of these three appeared around the time that Jesuit missionaries were first introducing their own hymnals in China; each also was never reprinted in any later music books. One melody, Wine Mad, is of an even more rare type: a drinking song for guqin; it was also never reprinted after the end of the Ming dynasty. Two melodies (Autumn River Night Anchorage and Wine Mad) are closely connected to but interestingly different from versions published in Shen Qi Mi Pu of 1425 (Hidden Virtue and Wine Mad respectively). Comment will be added on the significance of the changes. Although the lyrics for all the songs are included below, it is not always clear that it was intended that they be sung out loud. For example, perhaps the qin player learned the melody by first singing it, than afterwards playing it and only thinking about the lyrics. This could help explain why the music followed a fairly strict method of pairing notes and tabalture. This program took place in Hong Kong two days before Mid-Autumn Festival. For this reason the melody Mid-Autumn Moon (1614) was prepared as a possible encore. 10. Ming melodies: Signature melody? Based on the title and contents of the melody Unity of the Great Ming I considered including it in several programs as a sort of signature melody for the whole series: its court connections suggest the possibility that it might have been created as a sort of patriotic hymn. So far I have reconstructed and recorded the two extant versions, published in 1539 and 1589 respectively. The 1539 version seems quite coherent and so I included it in the second program. The 1589 version would fit into the time frame of the third program, but I still consider my reconstruction of that version incomplete. In addition, I am not yet satisfied either with my understanding of the source of the lyrics, or with my translation of them. Without a better understanding both of the source, meaning and style of the lyrics any understanding of either of these melodies must be considered as very tentative. Return to my performances or to the Guqin ToC.